Thanks to Cost Plus World Market for kindly providing the gorgeous, shiny things for this makeover. Affiliate links are used in this post. My teeny tiny foyer has been in a sad state. I painted it a few years ago, added that DIY custom built corbel floating shelf, and then promptly neglected it since then. That light fixture has been a thorn in my side, too. So ugly. And the vacuum was just there all the time for no reason. 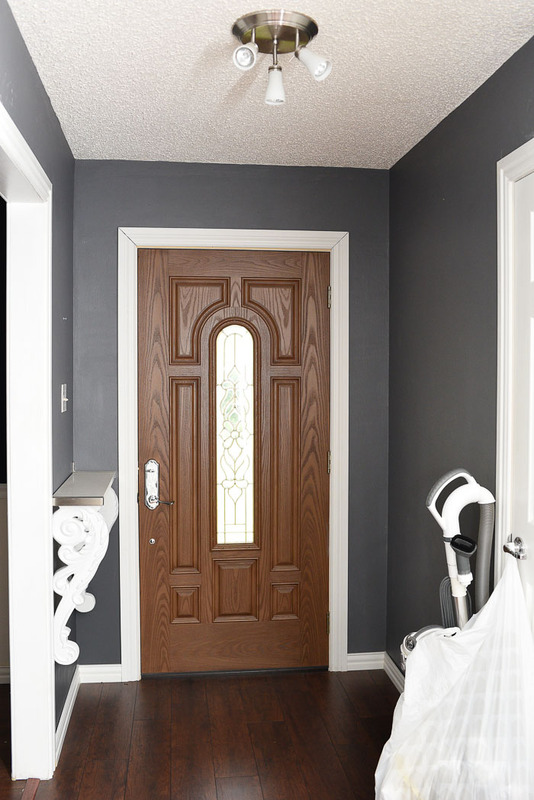 The space is small, and technically only the left half of it is usable since the door has to open. While small spaces definitely have their challenges when it comes to decorating, it is achievable if you take a top to bottom approach to maximize decor opportunities AND function. 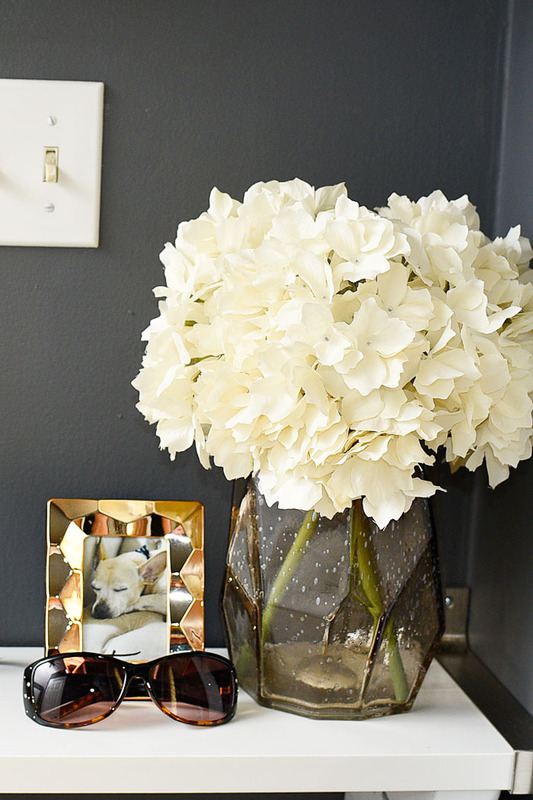 You have to have both form and function when decorating a small space. That meant I needed a new light fixture (top) and a new rug (bottom) plus some accessories in between to tie it all together. 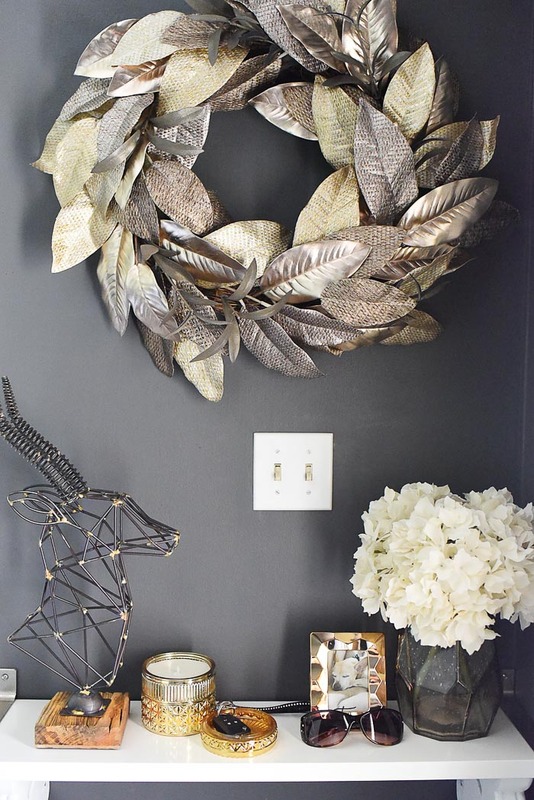 I chose to snag all my decor items from Cost Plus World Market’s Super Natural collection. 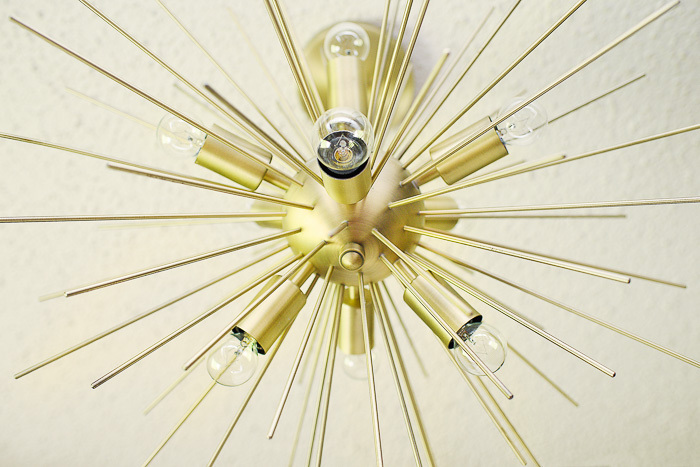 I ended up going with the Brass Starburst Collin Chandelier. It makes a BIG impact in the space and provides plenty of light due to its nine (yes, 9!) bulbs. 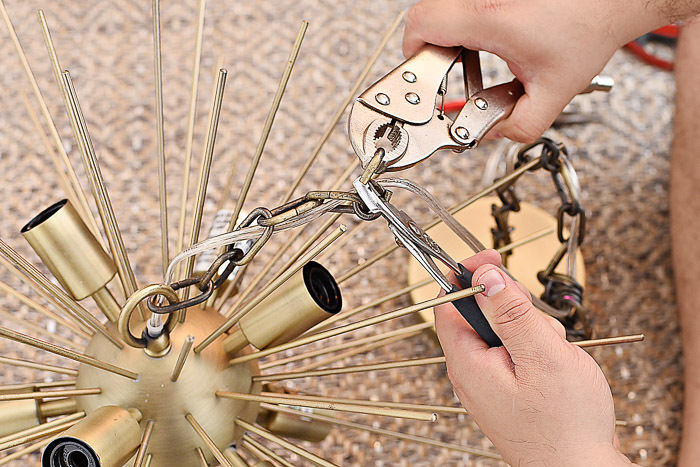 Lighting is a great way to make a statement in a small space — think of a bold table lamp or oversized floor lamp. In my case, I went for retro glam and mega style. It is a hard-wired fixture, and we had to make a few modifications to fit it into our not so grand 8-foot ceiling space. Daniel used some vice-grips and pliers to take off/open a chain link and remove a long section of links from the chain to shorten it. We ended up leaving 6 links total on there. Installation was easy since we just attached the fixture to ceiling with a simple brace (included with the chandelier) and two small screws. It is STUNNING. Totally makes the space. 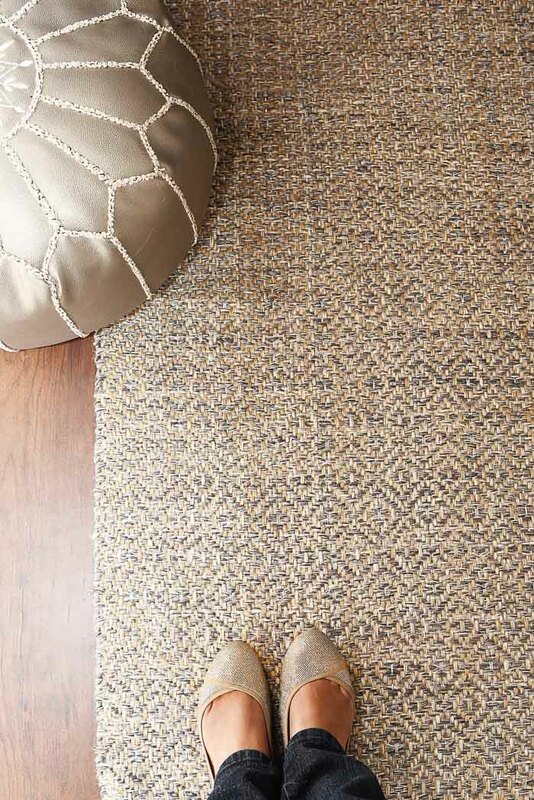 I also chose a small 3×5 rug — the Gray Metallic Woven Jute Alden Area Rug to be exact — for it’s silver metallic threading and jute finish that hides dirt/pet hair/all the things. This photo doesn’t do this rug justice. It’s a warm color with shimmery strands of silver woven through. It’s practical and beautiful. I may need the large size for my living room. 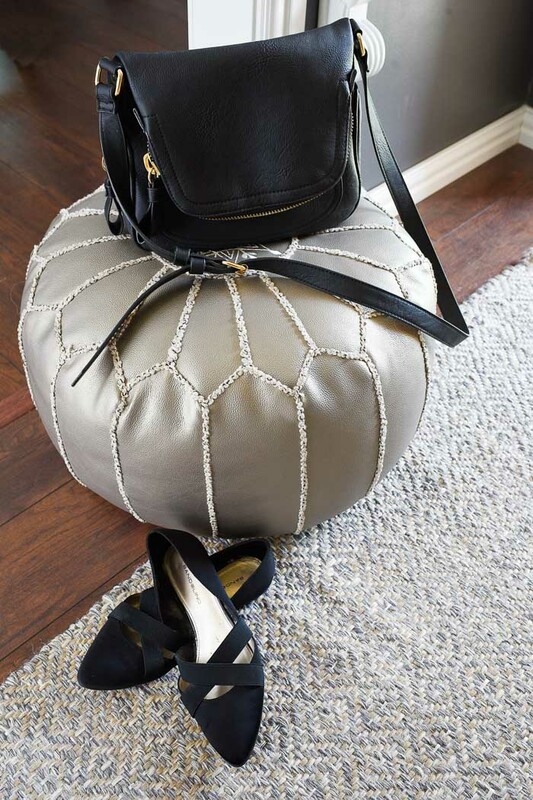 You can also see the Metallic Embroidered Leather Pouf I added to the space. 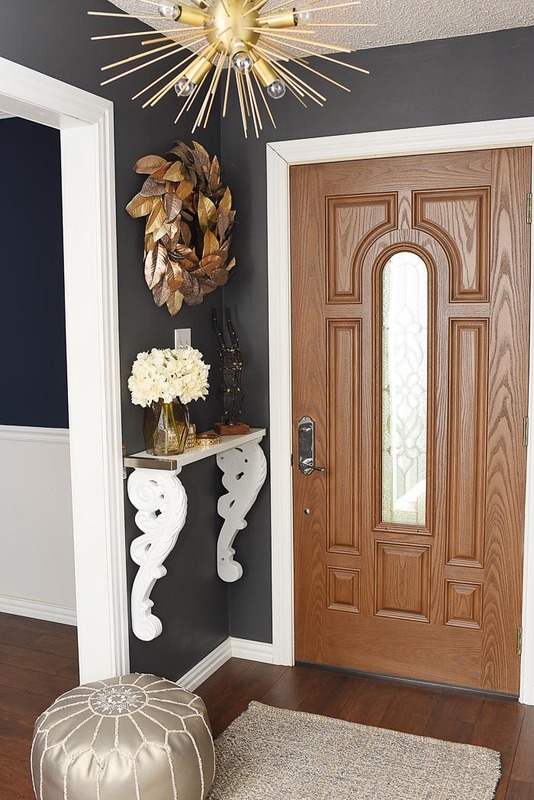 I think this is a versatile piece for a foyer because you can use it as a landing spot for mail, purse, shopping bags or use it as a bench to kick off your shoes after a long day. It looks pretty, but is also functional. I think Pee Wee is eyeing it as a new napping spot. He loves the rug, no joke. He has a penchant for rugs. 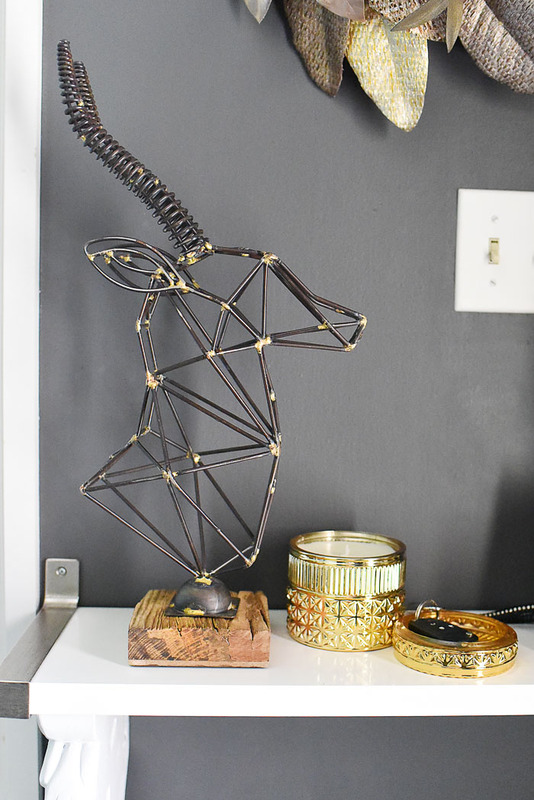 Finally, I decided the shelf also needed some new decor and I love faux taxidermy, so I HAD to buy the Geometric Iron Buck. The gold accents on the joints give it a dash of glam, and you all know I love me some gold. It’s a unique decor piece, and I can decorate him for the holidays. 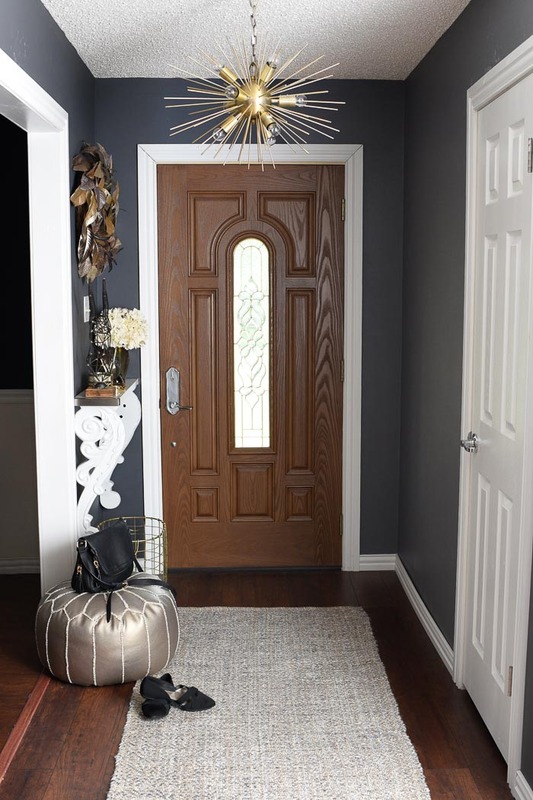 The Gray Faceted Bubble Glass Vase (large size) also ended up in my cart because the imperfect, raw quality really spoke to the decor vibe I wanted in the foyer (laid back luxe). 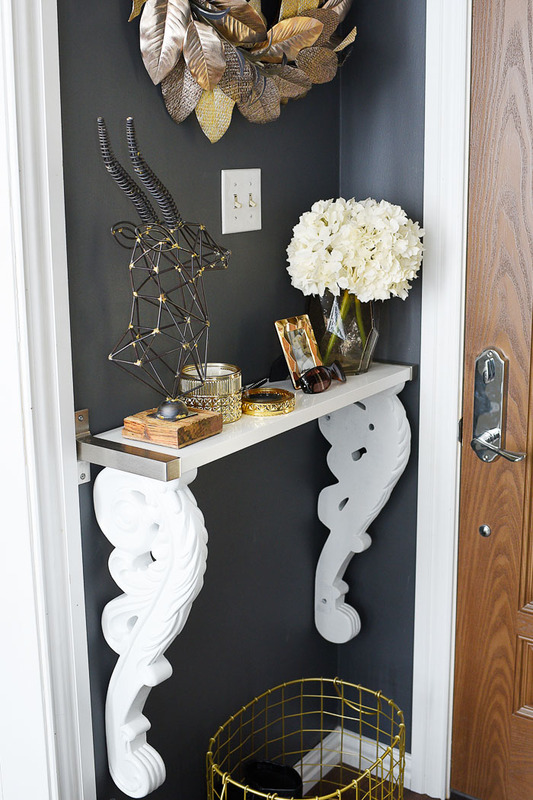 All together, this shelf area is filled with a neutral, natural metallic theme that is perfect for a small space. Not too overwhelming. So, who wants to come over and enjoy this small, yet stylishly grand, space? 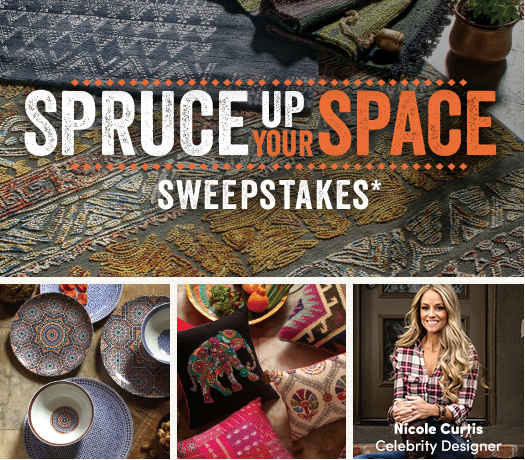 And make sure you enter the Spruce Up Your Space Sweepstakes– you could win a $5,000 (!!!!) Cost Plus World Market shopping spree and a design consultation with Nicole Curtis. What do you think of my small space/foyer update? Yours came beautiful (I just did mine back in June) great inspiration. I love your wall color, what color is it? 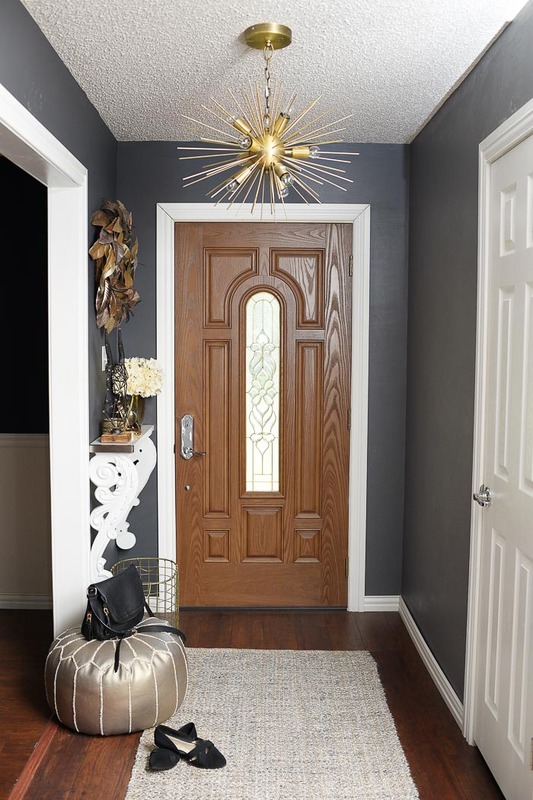 Love the changes you've made to the foyer, and especially that light fixture! It's a total game changer. World Market has the best home stuff! Our new HomeGoods opened last week next to the World Market. I can't get the car within a 5 mile radius or I'm in serious trouble. So happy to see Pee Wee–he made my morning! Oh I love it Monica, it looks fabulous. Love the wreath too.